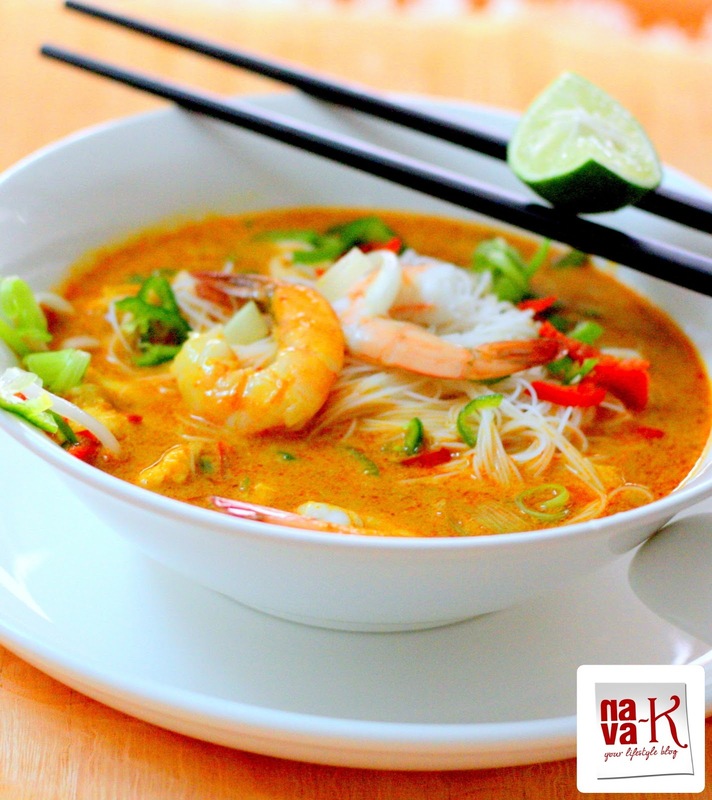 Various ways, various styles and various types of Curry Laksa availability. Of course. In fact, I myself I think have already shared a fair bit (Home Made Curry Mee, Curry Chicken Noodles, Malaysian Lamb Curry Noodles & Nyonya Curry Laksa). Curries by far too, what should we say? There's a huge collection and I bet you will not be short of those different kindas between in-country and out of Malaysia countries. Wouldn't you agree? If you are asking me, in my Indian house, curries are a food stealer, maybe not so much for me, but for my other half-half especially (Assam Fish Curry, Indian Chicken Curry, Lamb Kofta Curry, Devil's Curry & Vegan Potato Curry). I can go on and on about curries, then again, my point is that curry is the main highlight for this Prawn Curry Laksa. Basically, curry broth made from prawn shells and heads, and we also need some fresh prawns for assembling alongside the rest of the ingredients. I think I have told you before? Why I save prawn heads and shells (Prawn Cocktail, Fried Prawn Wantons, Grilled Spicy Prawns, Chinese Prawn Fritters & Prawn Petai Sambal)? Obviously, each time I wanna make prawn curry broth (Tamarind Prawn Curry & Prawn Mango Curry), or even for other dishes, these will be handy (Prawn Noodle Soup) and Curry Laksa can't be perfected without coconut milk (Coconut Salted Fish & Shrimp Coconut). Prawn Curry Laksa? Amazingly vibrant and will be exciting to our palates right? Simmer prawn shells/heads in water to extract broth (will take about 1/2 hour). Fry onion, garlic and shrimp paste in oil for about 2-3mins. Add chili paste and curry powder. Continue frying till oil splits. Pour broth and season with salt. When broth reduces to three quarter, pour in coconut milk. Meanwhile, assemble noodles and prawns. Pour broth over and garnish with spring onion, red chillies and green chilies. Serve with lime while piping hot. I like this but kinda hard to cook portion for one ir two. That's why am nit too keen to cook this. my favourite! I prefer mine with thick bee hoon. This is a hard dish to cook! time consuming too! I always blindly believe coconut milk, anything you make with, be it addition of veggies or meat, it comes out like a fool proof recipe! And light on the tummy too! The shot looks very inviting and the chopsticks makes it look even more authentic. Super luking and fantastic prawns dish. It looks absolutely appetizing! Certainly admire you for cooking from scratch and not resorting to ready made paste. Delicious prawn curry Nava, coconut milk makes it everything good. Absolutely loving each one of your comments. Thank you so so much. 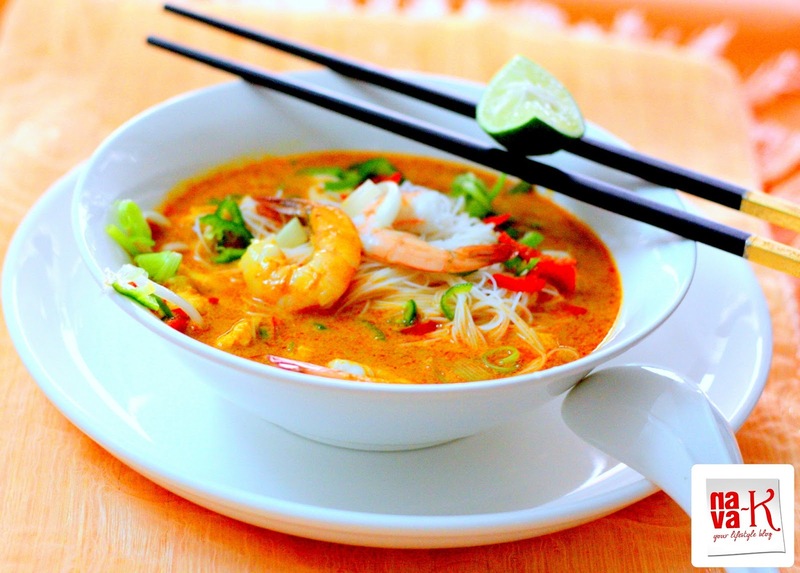 Lovely Prawn curry laksa. Looks delectable! This sounds great, lovely bright colours.